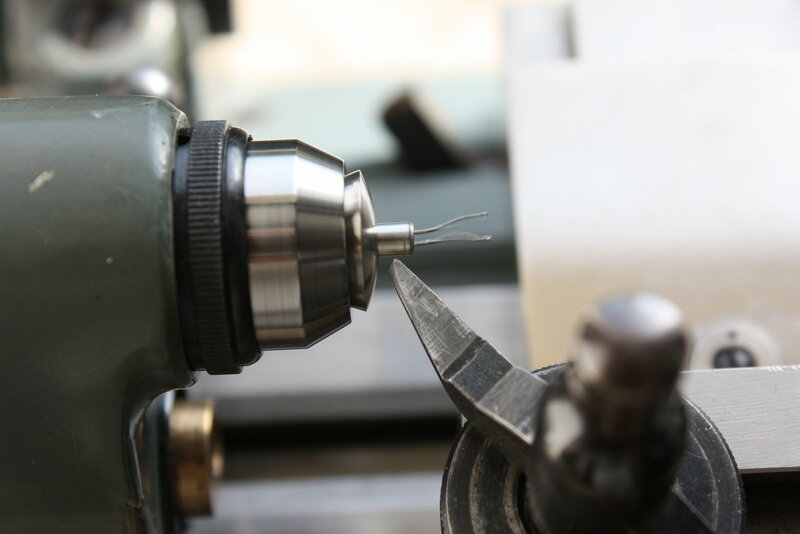 The accuracy of a watch depends largely on the oscillation frequency of its timekeeping element. In a mechanical watch we find a spring and balance wheel for this purpose. 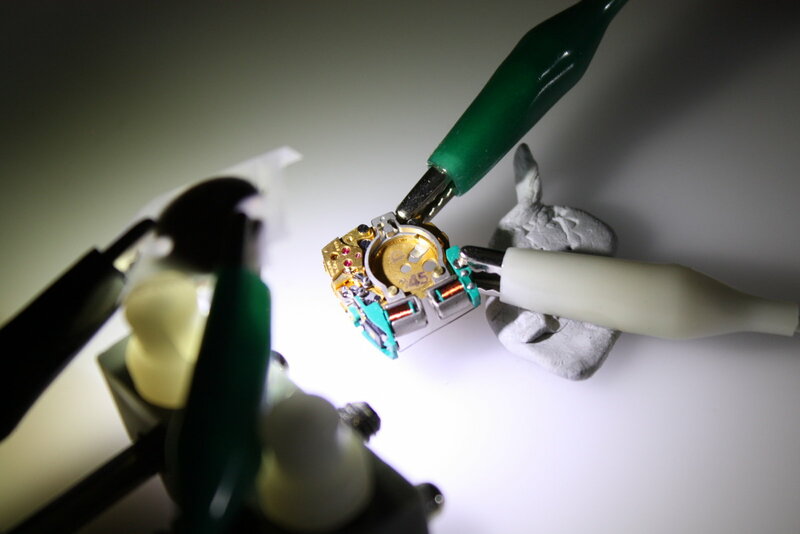 The faster it can oscillate, the more accurate the watch can be (more details here). However, the maximum frequencies of mechanical oscillators are very limited due to mechanical stresses, inertia, the viscosity of oils and so on. Usually mechanical watch movements don´t make more than 36,000 beats per hour (this means the balance makes five oscillations à 2 beats per second -> 5 Hz). It´s easily understandable that it was quite a revolution when movements with electronically controlled timekeeping elements hit the market starting from the mid 1960s. The famous Bulova Accutron watches for example used an electronically sustained oscillation of a tuning fork that allowed for much higher frequencies like 360 Hz in the case of the Bulova 214 movement (or even 440 Hz in the Bulova 221). Only some four years later, in 1969, Seiko introduced the Astron with a quartz crystal oscillator running at comparably stunning 32,768 Hz. The oscillations of Accutron tuning forks are much to fast to be visible with the naked human eyes, but wait -> you can make use of the stroboscopic effect to "slow this fast movement down". How to get a strobe light? 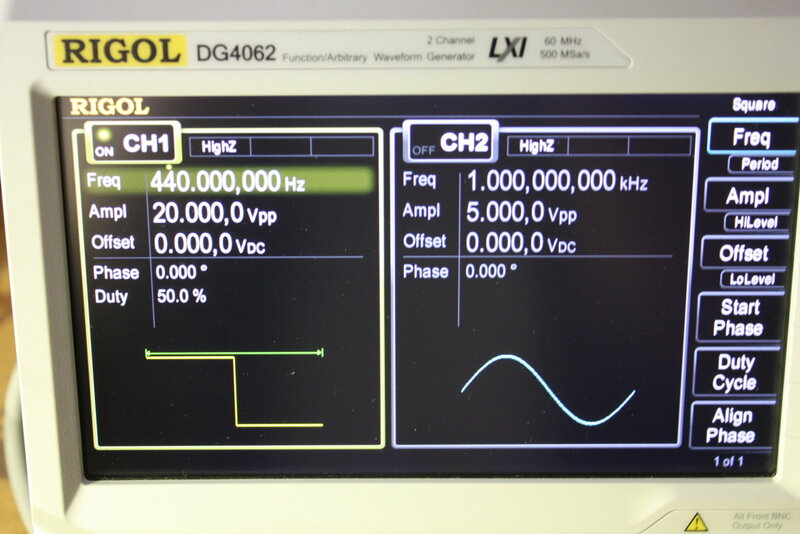 I used my Rigol DG4062 function generator coupled with a Cree XM-L2 power LED. 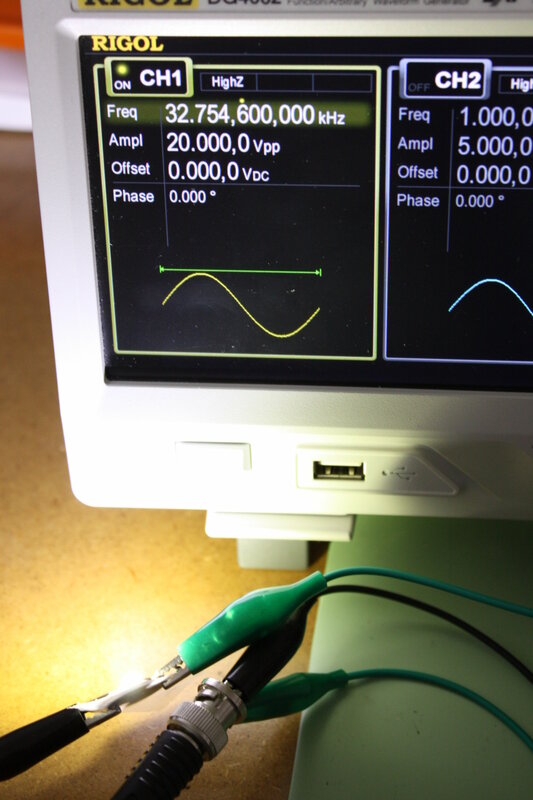 I then selected a square wave pushed to the maximum amplitude...pretty bright. The tuning fork of the Bulova 221 oscillates at 440 Hz - let´s set this frequency in the DG4062. 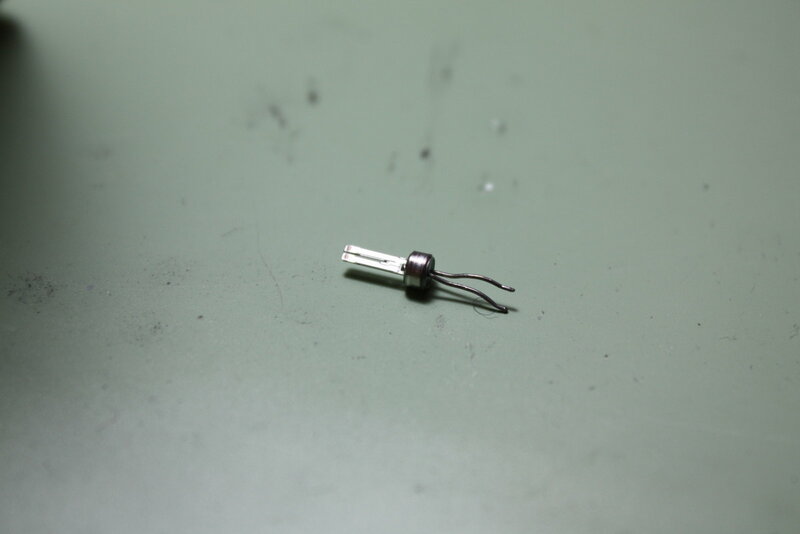 The Bulova 221 gets placed in front of the strobe light. With a flashing frequency around 440 Hz, the oscillation becomes very well visible. The video also shows how the tuning fork oscillation is translated into a turning movement by two small fingers which drive a tiny wheel - the "index wheel" - with hundreds of teeth (the lower index finger is fixed to the fork and moves this wheel forward one tooth / oscillation, the upper pawl finger is just as important as it prevents the wheel from turning backwards while the index finger moves away). I also want to recommend Richard Kunze´s great slow motion videos of several other tuning fork movements. The delicacy of Accutron-like movements and their high production costs were also one of the reasons why they died out soon. 32,768 Hz quartz crystal resonators and the integrated circuits to drive them became easily mass-producible in the late 1960s. 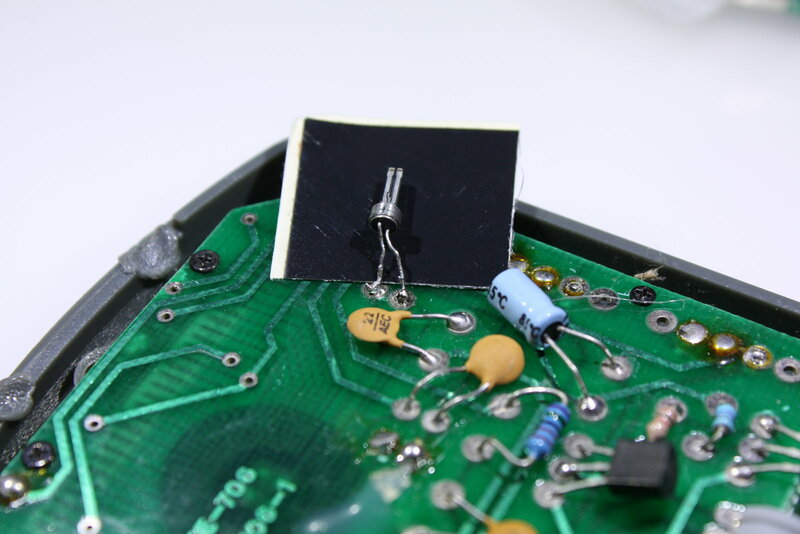 No wonder that the 32 kHz frequency also became a standard in electronic watches that is still used in most of today´s quartz watches. 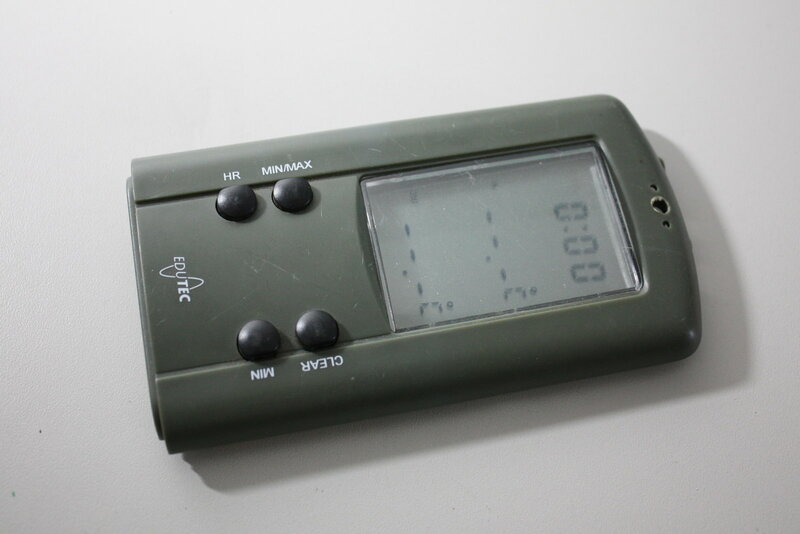 This is an old electronic thermometer from an e-waste dump. 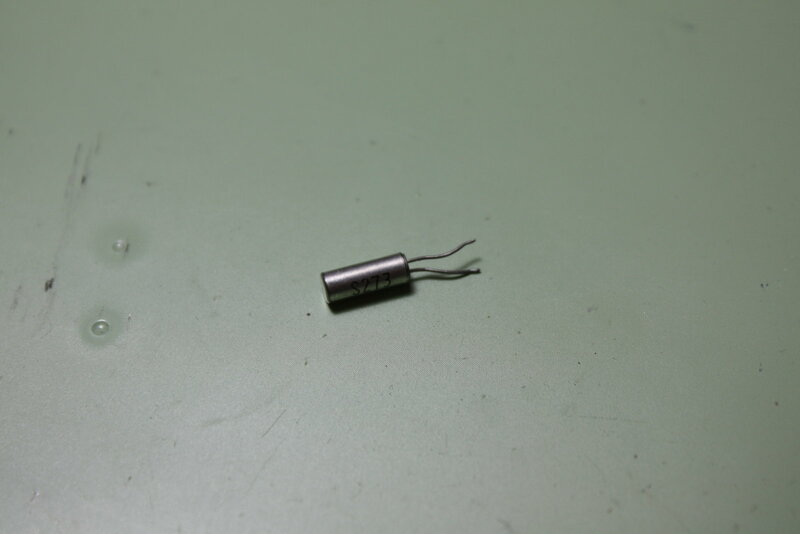 The piezoelectric resonator in all its glory - it´s just 5 mm long. 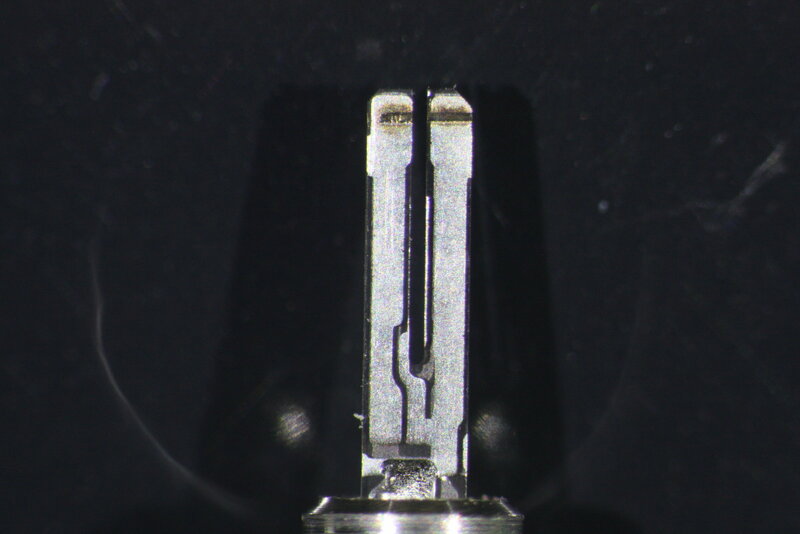 Still somewhat closer: On the tips of the tines you can see small horizontal marks. 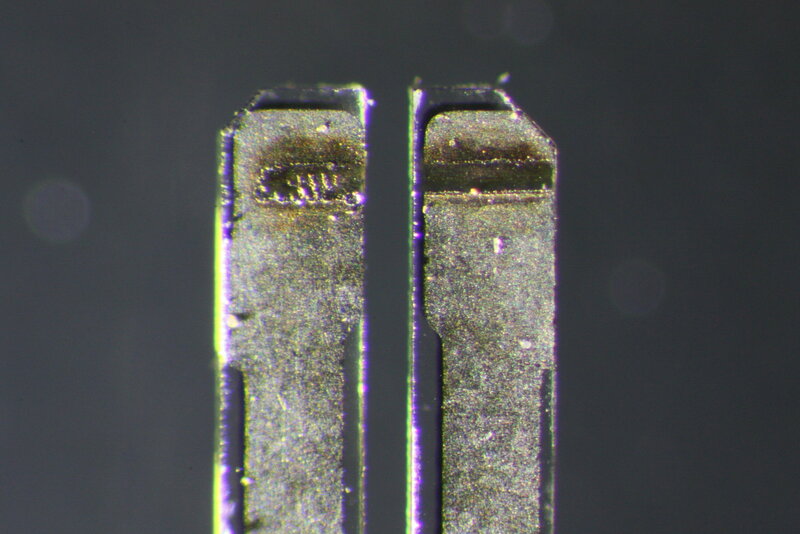 These are small trenches from laser trimming which is used to adjust the resonator exactly to the desired 32,768 Hz. 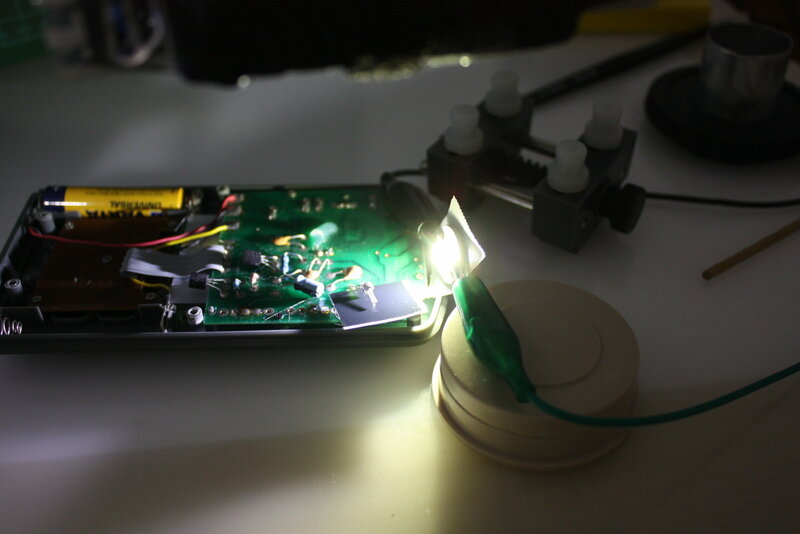 ...together with my improvised Cree-powered strobe light.